Goa Gajah (Elephant Cave), village of Bedulu, district of Blahbatuh, Gianyar Regency, Bali. Goa Gajah, if in English is Elepham cave. Unlike its name, Goa Gajah not cave inhabited by elephants, or elephant-shaped cave. I do not know the beginnings and history of the name of this cave, so that the people gave the name of this cave with Goa Gajah (elephant cave). While visiting attractions on Goa Gajah, he cave area, was very strong magical shades. This attraction is a historic place for residents of Bali. In ancient times, this area is the place to be imprisoned sages. 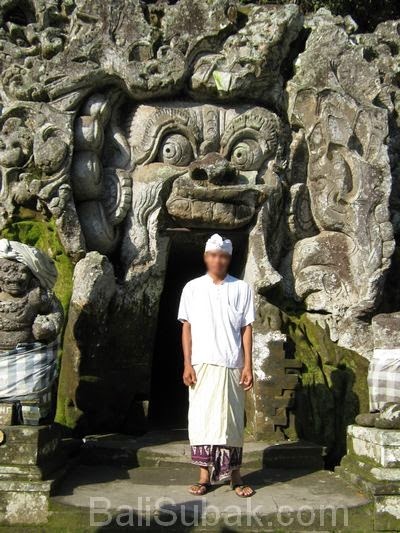 Goa Gajah is an artificial cave, which is made by man. This cave was made and used to meditate. A long time ago a lot of people like to be imprisoned. Possible to draw closer to God, or perhaps to get mysticism. When I entered the cave, a tunnel in the cave just enough traversed by a single person. I have a fairly high body, unlike the Indonesian people in general. So when entering the cave, my body should be slightly bent, so that my head does not hit the ceiling in the cave. While in the cave tunnel, I kinda creeps. Dark with a little light from a small lamp. The T-shaped cave tunnel. The air was slightly damp but no water flow, not like a cave formed by nature. Because the T-shaped, so there are two ends in the cave. The tip of the left and right, or to the east and the west. At each end there is a place of worship. The tip on the left there are three lingga for to worship. 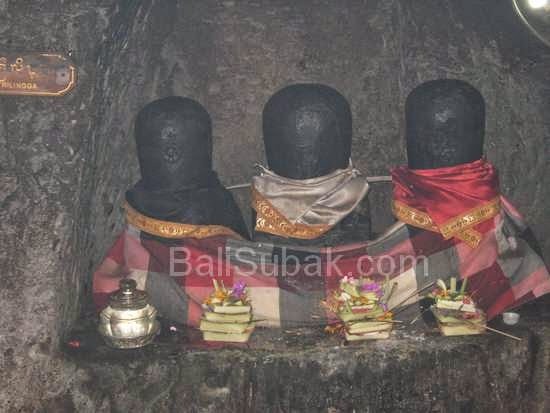 Lingga is like standing oval stone, characteristic of the object to worship the lingga is to Shiva. But when considered more carefully, three lingga was wrapped with different colors. Cloth of red, white, and black. For Hindus, the color red is a symbol for Brahma, while black is the symbol for Vishnu. So, lingga is a three-symbol god as ruler of nature, which is God as creator (Brahma), God as the preserver (Vishnu), and God as the fuser / destruction (Shiva). The tip on the right there is a statue of Ganesha. The statue was intended to worship the god Ganesha, the god for science. 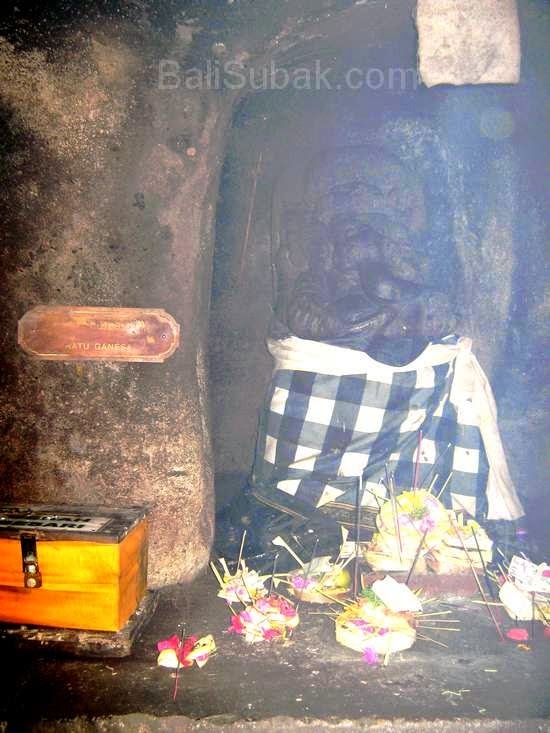 Of the presence of the statue of Ganesha, it can be concluded that the making of this cave aims to seek knowledge to invoke the grace of God. On the outside of the cave, the outer wall of the cave, carved to resemble a human face. But when considered more carefully, they manifest elephant carving shape. There is a very large fangs. On this earth only elephants that have very large fangs. Eyes on the engraving turned to the right. For Hindus, the right is the symbol of goodness. So the purpose of making this cave is to seek knowledge about goodness. Hole cave is elephantiasis grandiose carvings on cave walls. In front of the cave, about twenty meters away, there are two pools. It is estimated that the pond is for bathing. 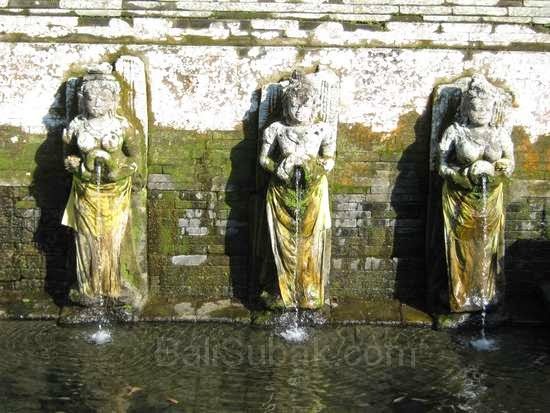 The pools were decorated statues of women spouting water. At the pool there are big fish. So, Goa Gajah (elephant cave) is a man-made cave as a place to meditate. This cave has a magical feel of a fairly large, so that when entering the cave area, we will feel the coolness and comfort. Nature around the cave is still well preserved. Although the construction of hotels and villas lot done, but I still kept the area well.